Your finished display should look as well-designed and attractive as your products do, while also withstanding retail wear and tear over time. Customer-facing interactions may produce some damage, but even routine stocking and cleaning can leave your displays with scratches and other imperfections. Powder coating keeps your custom display attractive and resilient. This durable and high-quality finish comes In a rainbow of colors, textures and other properties. The fine powder used in this process combines polymer resin with pigment, leveling agents, curatives and other additives designed to reinforce the coating when it is applied to the intended surface. We offer durable, efficiency-minded finishes. Each one is electrostatically applied with spray guns to ensure an even coating, and then baked in a gas-fired curing oven. The application of heat at the end of the process facilitates the creation of long molecular chains with high cross-link density, effectively "setting" the coating in place. The types of wear and tear that powder coat can resist is broad and flexible. 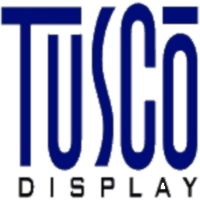 Just as your displays are custom to your needs, we choose the right coating for your specific application; a capability that fits naturally into Tusco's mission to remain nimble and easily adapt to your projects’ needs. The conditions that powder coating can address include prolonged contact with harsh chemicals, impact, ultraviolet light, moisture and other extreme conditions. How can powder coating be customized to suit my custom display needs? Powder coating is both durable and eye-catching, combining practicality with aesthetic appeal. Custom colors can be readily produced as long as a five-gallon or 50-pound minimum is met. The specific features of resistance can be customized for each powder coating formulation. This saves you money over the course of your display and reducing the incidence of wear issues like fading, chipping, abrasions and corrosion. Overall, this process extends the life of your display. Beyond powder coating, we offer plating options including chrome and zinc plating. Both of these processes produce surface barriers to prevent corrosion and are provided by supply chain partners who meet our quality and environmental standards. Contact Tusco to discuss your next project's powder-coating and finishing requirements.